I threw this sandwich together one day with the stuff I had in the fridge. This combination just really seems to show off what's great about kimchi: it's sweet, sour, spicy, and salty all in one jar. It was so surprisingly good that I had to recreate it for my wi. She loved it, too, and she isn't even a huge fan of kimchi like I am. It got such a good response that now I'm sharing it with you. This simple recipe comes together in a matter of minutes, especially if you use store-bought kimchi, but here's a recipe for how to make your own. Think of this sandwich as the banh mi's Korean cousin. The two sandwiches have a similar appeal, but the kimchi sandwich is so much simpler to make because it has far fewer components. Feel free to swap out the tempeh for a fried egg, pan-fried tofu, or sliced portobello mushrooms if you like that sort of thing. Preheat the oven to 350 degrees and place the bread in the oven until it is warmed through (about 6 minutes.) Trim the ends off of the bread and split it down one side while leaving the other side still attached like a hinge. Set aside. In a medium pan over medium-high heat, add the oil to the pan. Once the oil begins to shimmer, place the sliced tempeh into the pan in a single layer. Cook until browned on one side (about 3 minutes), and then flip the slices over and allow the tempeh to cook for another 2 minutes. Remove pan from the heat and drizzle in the soy sauce. Toss to coat. Set aside until you are ready to assemble the sandwich. Open the baguette wide; using a fork, smash the avocado onto the bottom part of the bread. 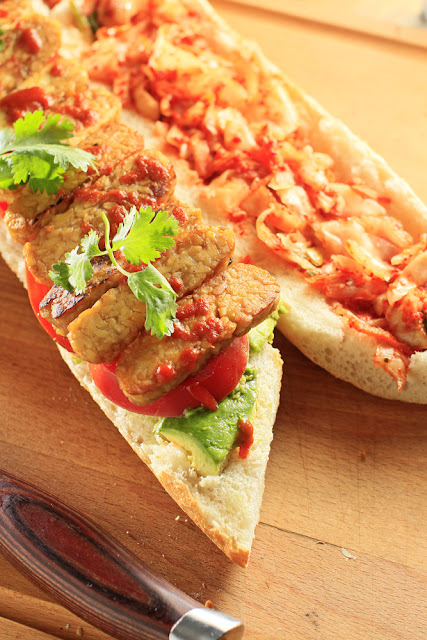 Layer in the tomatoes, kimchi, and the crispy tempeh. Spread the mayo onto the top part of the bun and garnish the sandwich with cilantro and sriracha. Slice into 3-inch sections. Makes 4 servings. The ideal plan for just-picked, in-season strawberries is to systematically find a million ways to use them until the end of May. This is the point at which you finally just can't stand to see another dang strawberry until next year rolls around. We're not there yet, so let the strawberry fest continue! The row of strawberry plants at Steve's farm is going strong with lots of daughter pants popping up, which means that there will easily be some ready to be transplanted to get ready for next year. 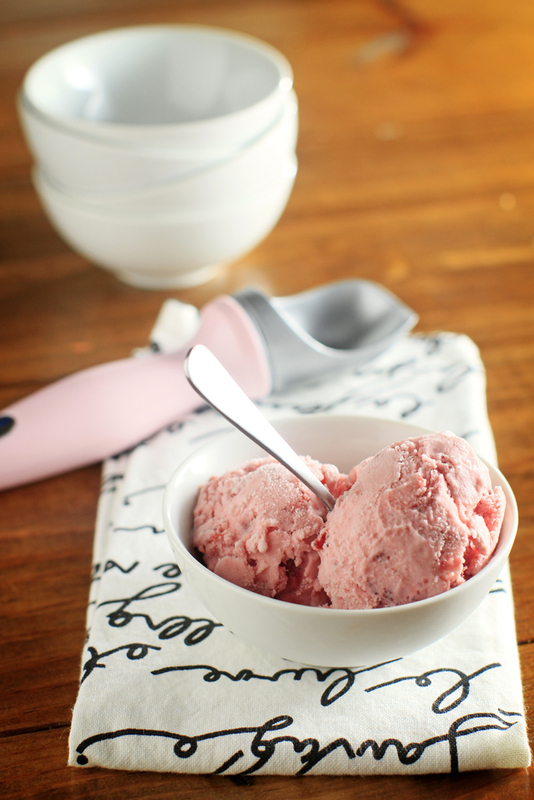 We made this ice cream to showcase these sweet, pesticide-free beauties. This is super-simple, comes together in no time, and seconds are just about impossible to resist. Hull and slice strawberries until you have 1 1/2 cups ready. Place berries and sugar into a medium sauce pan on medium heat for 3-5 minutes. Set them aside to cool. Whisk cream, milk, vanillas, and salt. Mash cooled strawberry mixture with a potato masher whisk into to the milk. Pour into your ice cream maker and let it churn for about 20 minutes. Transfer ice cream, which will be soft, to a container and let it harden in the freezer for at least 3 hours. 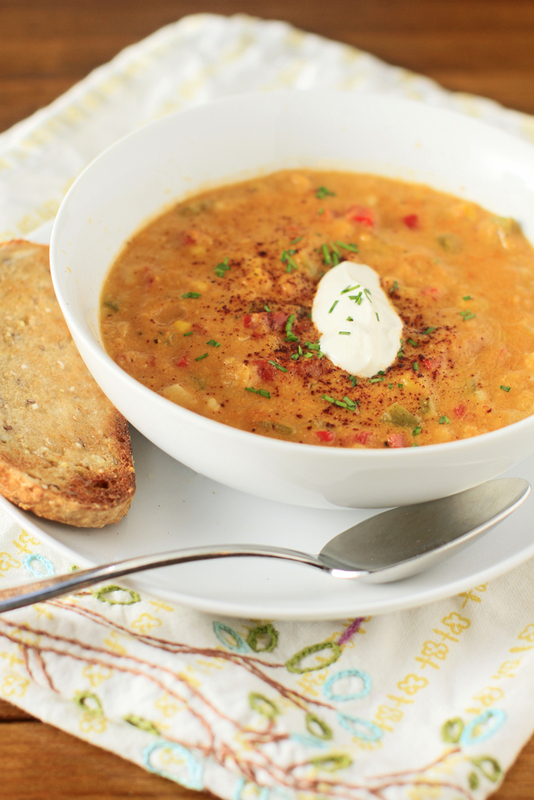 This simple corn chowder was the result of some very desperate late-night hunger pangs. Creamy, sweet, and spicy, it comes together quite quickly and makes for a hearty meal when served with a thick slice of whole wheat bread. (Don't worry if spice isn't your thing -- it's tempered by the sweetness of the corn.) Make it a day ahead and the flavors come together even better. It's strawberry season, y'all. 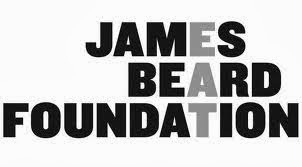 We are so very excited. 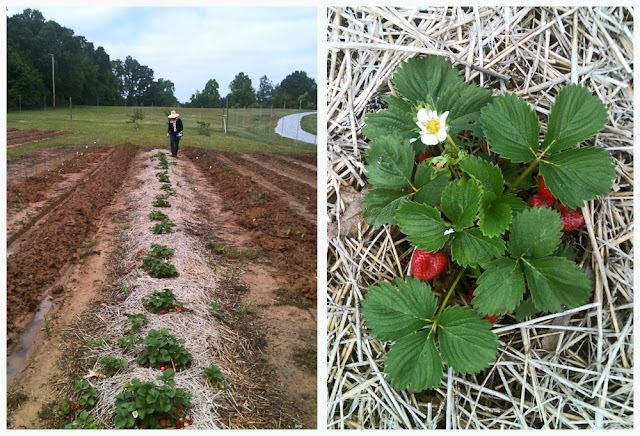 Steve, The Chubby Vegetarian farmer in residence, has one long 30-foot row of strawberries growing on the farm. We traveled out to Slayden, Mississippi to pick a bunch of the jewel-colored beauties on Saturday afternoon. After sharing a quart with a lady at the antique store, we still had about 4 quarts to take back home with us. These strawberries were unlike the pale golfball-sized monsters you find in most supermarkets. These things were beautiful: small, dark red, and sweet. For the most part, we just dipped them in a little whipped cream and ate them whole, but we though we'd do something special with a handful of 'em. One favorite drink is a mix of mint and strawberries called See You in September. This drink was created in that same spirit. Here, gin adds a nice botanical note while the tarragon adds something a little unexpected to this cocktail. The blood orange bitters were handmade by our good friend Michael, but feel free to substitute angostura bitters if you can't find blood orange. 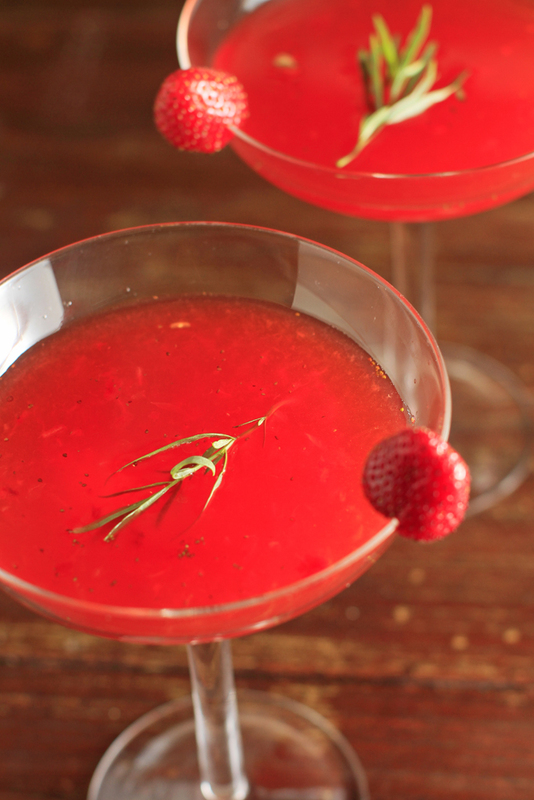 Place the strawberries, lemon, tarragon, ice, bitters, gin, and agave nectar into a large cocktail shaker. Muddle the mixture until the strawberries are broken down and most of the ice is cracked. Strain into 2 champagne or martini glasses. Garnish with a bit more tarragon and a strawberry. Growing up, we never had pickled watermelon rind, but it's pretty old-school Southern, so we had to try it and see what all the fuss is about. And what could be better than using up all the parts of an oversized watermelon and cutting way down on waste by making something surprisingly different and really good? 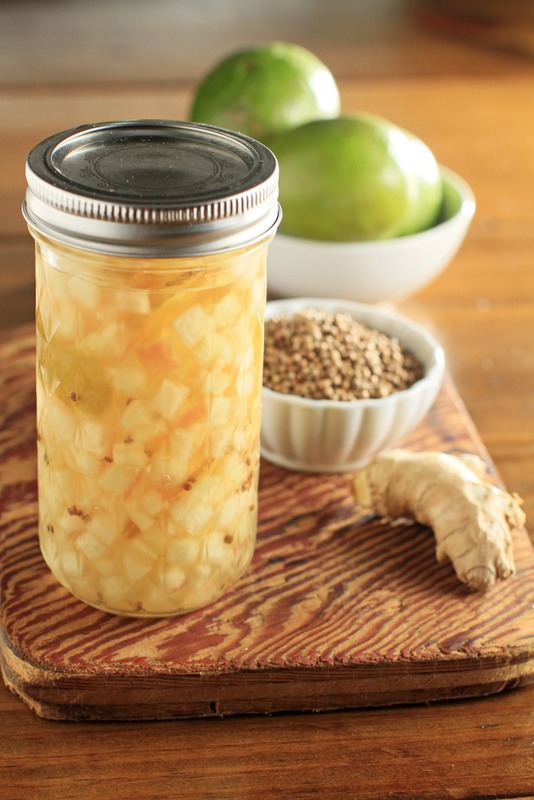 One summer, we learned how to pickle rind, and after that practice round, now we know how to get it right. One trick is to avoid using big slices of the white rind; a fine dice is more visually appealing and easier to use as an accent on a cheese plate or salad instead of the focus of a dish. Place diced watermelon rind in a 1 1/2-cup jar. In a medium saucepan, bring the vinegar, water, ginger, lime rind, coriander, cinnamon stick, sugar, and salt up to a boil. Pour the liquid over the rind and let it cool on the counter for about an hour before sealing jar and storing in the fridge for up to a month. *Watermelon rind is a good source of the amino acid citrulline and offers cardiovascular health benefits. I use smoked sun-dried tomatoes in many savory recipes from Spanish tortillas to vegetarian gumbo to carbonara. They add complexity to any dish. There is the sweetness of the concentrated fruit sugars, the natural acidity, a light saltiness from the drying process, and of course, the smoke, which is really the thing that really elevates this ingredient. A lot of our readers have had trouble finding this slightly elusive ingredient. For this reason, I will give you 3 options for procuring smoked sun-dried tomatoes. If you try them once, you'll be hooked just like we are. The first way is the simplest: buy them. A company called California Sun-Dry sells smoked sun-dried tomatoes in 3-ounce bags. 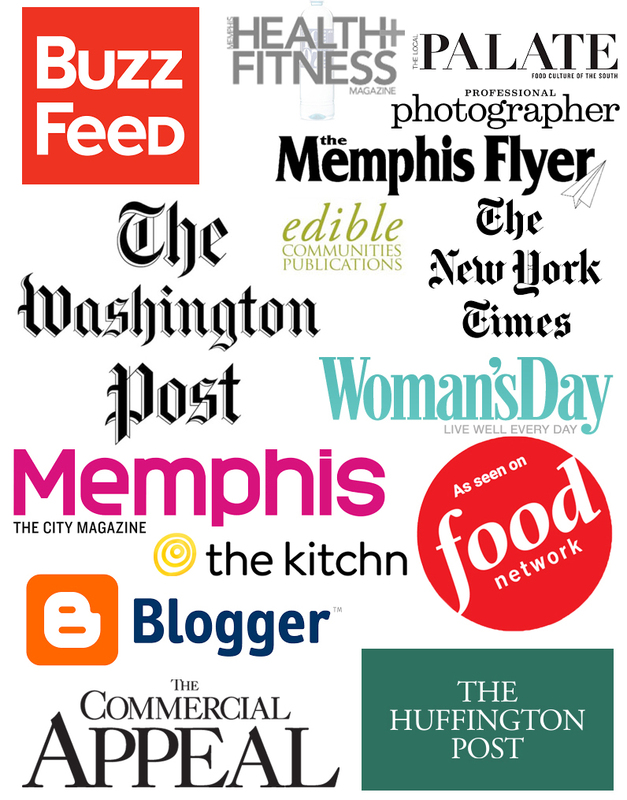 Click here to view a complete list of where you can find their products. Another method that's nearly as simple is to add liquid smoke to dry-packed sun-dried tomatoes. I think a good ratio is 1 teaspoon per cup of sun- dried tomatoes. 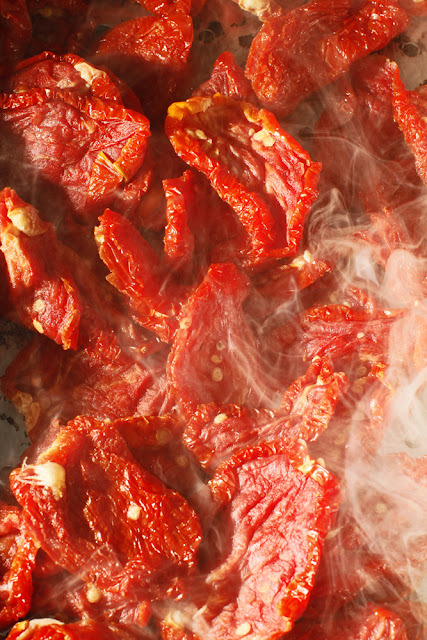 Place sun-dried tomatoes into a food storage container, sprinkle in the liquid smoke, cover, and shake. Set aside in the refrigerator for at least 20 minutes so the flavors can meld. Finally, you may smoke them yourself. It's easy if you have a few simple items and a little know-how. This is my favorite method as it yields an authentic and aromatic smoky flavor. It's best to make these in a large batch. They will keep unrefrigerated for 6 months because they are preserved two ways. You will need some special equipment to make your own. Many grill-top or stove-top smokers can be found online or at almost any specialty kitchen store like Viking and Willams-Sonoma. I made my own smoker using a 9x12 stainless steel pan with a shallow, perforated basket and a tight-fitting lid. You could also use an old stock pot with a lid and an old footed colander that will fit down inside the pot. Just remember, the lid has to fit tightly to keep the smoke in, and anything you use has to be dedicated to smoking -- it will be completely ruined for any other purpose. The main thing is that the large pan has to be at least 1 inch deeper than the perforated pan so that there's room for the wood chips. You'll also need an outdoor gas grill and some wood chips, which are available at most grocery stores -- especially during the summer months. 3. Lay sun-dried tomatoes (or mushrooms, dates, garlic or anything else you want to taste smoky) in a single layer in the smoker basket and place over the smoking wood chips. 4. Cover with a tight-fitting lid. Wait 4 minutes. It doesn't take long for vegetables and fruit to soak up that smoke flavor. Remove smoked tomatoes from the basket and allow it all to cool. Any one of these 3 methods will give you that rich, savory, smoky flavor that adds so much to so many vegetarian dishes. Give smoked-sun dried tomatoes a try. What will you make with them? We don't see trifle as dessert very often in the South these days. Maybe they're a little old fashioned? But hey, there's really nothing wrong with that. We figured this simple dessert with a lot of texture would showcase the first strawberries of the season, the first batch that our respective dad and father-in-law Steve grew for us. These little individual trifles-in-a-cup are quick to put together if you use a shortcut, cubed vanilla dessert cups -- sort of like sponge cakes and usually available in packages of 6 -- instead of making your own shortcake. Toasted in the oven, they lend the dessert a crunchy texture that's really different. Preheat oven to 350 degrees. Hull and slice strawberries. Add sugar and lemon juice, and toss to combine, then set aside in the fridge to macerate. Cut the mango into cubes and set aside. Toast the dessert cups in oven for 10 minutes. 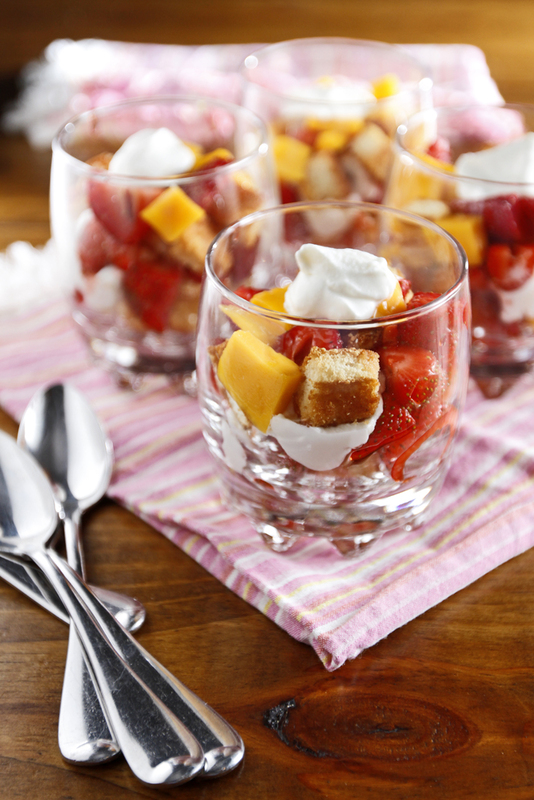 Layer the strawberries, mango, whipped cream, and toasted dessert cups into 4 highball cups. Press down the layers with the back of a spoon. Drizzle 1 teaspoon pomegranate liqueur over each trifle. No need to wait like you do with a traditional trifle; these are best when served right after you make them. In the kitchen at Restaurant Iris a year ago, I watched Chef Kelly English prepare his dish "Midnight Snack" for a photo shoot. It's made with toasted brioche, a poached egg, and sautéed shrimp that are tossed in his signature remoulade sauce. I told him then and there that I was going to make a vegetarian version of that dish. 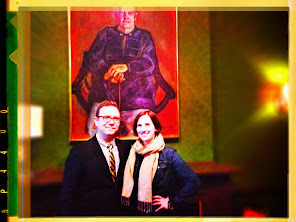 I did -- and it was awesome. Then recently Kelly kindly sent me the recipe for his remoulade sauce. (Can you believe it? I thought that kind of thing would be top secret.) I made the dish again with his recipe, and it was quite a revelation. The sauce made it, so much so that we had no choice but to enjoy two full servings each! My grandmother used to make fried pies for us all of the time. There was nothing better than to be sent back home from Mamaw's house with a bag full of peach, apple, plum, and my favorite, chocolate fried pies. They were so wonderfully greasy that they would make dark spots on the outside of the paper grocery sack that held them. Why can't fried be as good for us as broccoli and cauliflower? Maybe one day. Until that day, we've come up with a way to get our chocolate pie without deep frying. In fact, there is very little at all to do. This deceptively simple pie packs a big punch thanks to some rich chocolate and just a touch of smoky heat brought on by chipotle pepper powder. Don't be scared off by the tofu. It's merely a medium to convey the chocolate to your taster. The texture of it is perfect for this, I swear. In a double boiler over medium heat, whisk the chocolate and cream together until chocolate has melted and the cream is incorporated. This takes 10 minutes. Into the work bowl of your food processor, add the chocolate mixture along with the chipotle, salt, sugar, and tofu. Blend until very smooth. Spoon mixture into cooked, cooled crust and smooth. 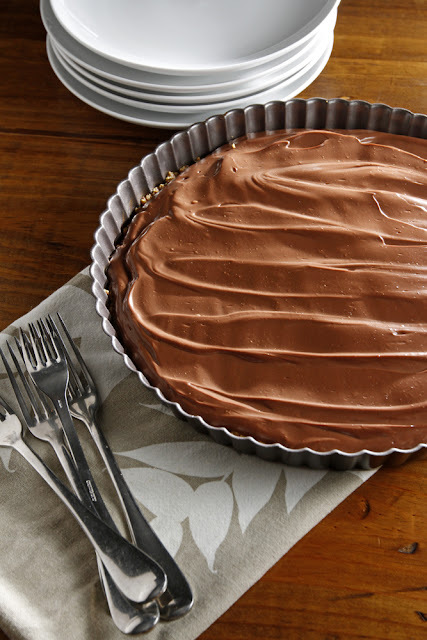 Allow tart to chill for 2 hours in the refrigerator. No need to bake it. Serve just like that or with a whipped cream or meringue topping. Preheat oven to 350 degrees. Place the graham crackers, butter, and sugar into the work bowl of your food processor. Pulse until finely chopped and butter is incorporated. The mixture should look like sand. Press mixture into the bottom of an 11-inch tart pan. Make sure to press crumbs into the scallops of the pan as well until it is 1/2 inch up the inside wall. Bake crust for 15 minutes. Allow it to cool completely before filling. 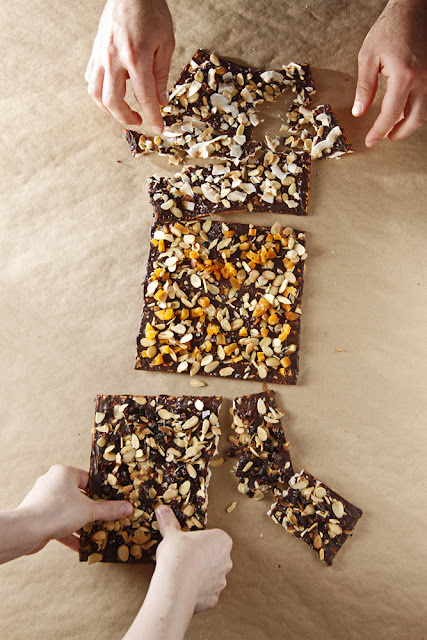 Our chocolate, fruit, and almond matzo can be used as a foil for ice cream, or you can just break them apart and share the 3 different flavors: toasted almond plus dried apricots, cherries, or coconut, and a generous sprinkling of Maldon salt. Assemble the apricots, cherries, coconut, and almonds in separate bowls and set aside. Place chocolate and cream in a shallow microwave-safe bowl and melt then stir for 3 20-second intervals. Mix it well. Using a knife, spread the chocolate ganache evenly onto one side of the matzo. 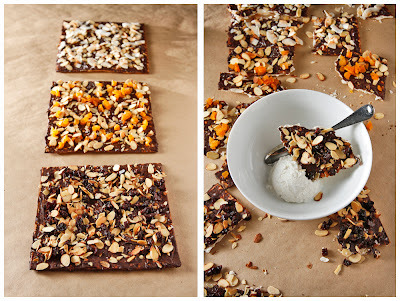 Sprinkle with almonds and apricots and then add salt to taste. Set aside. Onto the next matzo, sprinkle the almonds, cherries, salt. Set aside. Onto the next one, sprinkle coconut, almonds, and salt. Use whatever toppings are remaining for the last one. Set these one at a time on a plate in the fridge; use waxed paper in-between. Set out on kraft paper and break them up into pieces. 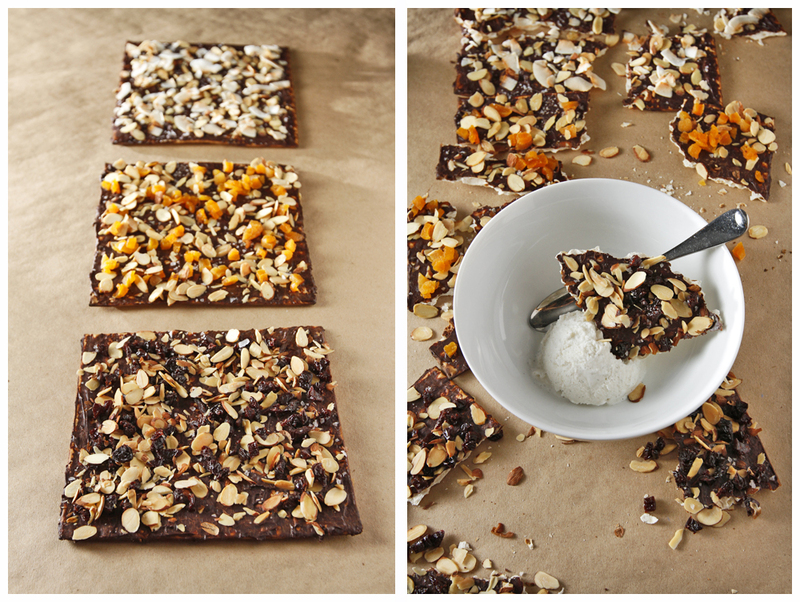 Serve with ice cream or just enjoy matzo by themselves. Whisk milks, cream, vanillas, sugar, and salt. Place into the ice cream maker. After about 30 minutes, transfer ice cream to a container and place into the freezer to harden (about 30 minutes to an hour) before scooping. 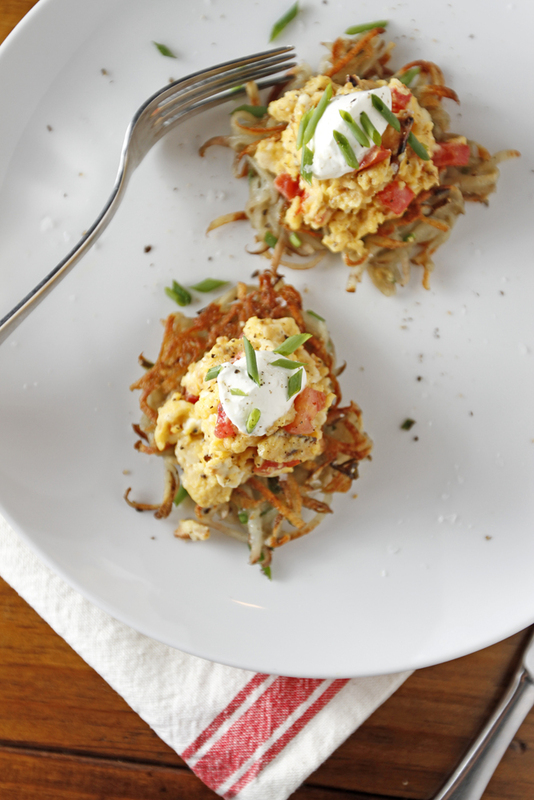 In honor of Passover, we decided to make a brunch inspired by the traditional foods. Our version of matzo brei uses both soaked matzo and crumbled matzo to offer two distinct textures of the same ingredient. We also added chopped tomatoes to give it that little something extra. We served the Matzo Brei on top of simple-but-delicious Truffled Latkes. Make these ahead of time and warm them in the oven. The edges are crisp, and the center is nice and creamy. In a medium bowl, add the milk and one of the crumbled matzo crackers. Add the tomatoes, sea salt, and black pepper to the bowl as well. In a large pan over medium-low heat, melt the butter then add the eggs and the soaked matzo mixture. Stir continually until the eggs are just set. Add the remaining crumbled matzo cracker and stir to incorporate. 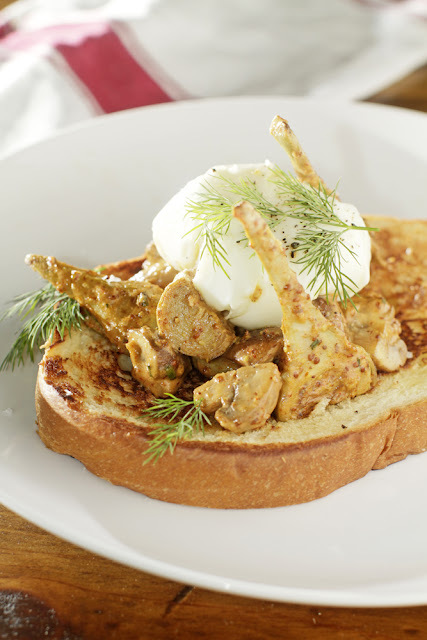 Place Matzo Brei egg mixture into a bowl until ready to serve. In a large bowl mix the potato, truffle salt, egg, flour, chives, and pepper until well incorporated. In a large pan over medium heat, bring the oil up to temperature. Add a 1/4 cup mounds of the potato mixture to the oil. This will need to be done in batches. Cook for 5 minutes per side our until browned. Keep warm in a low oven until ready to serve. As much as we love it, we have never made a pecan pie in our own kitchen until now. Why not? We swore off of corn syrup in any form years ago, and it's the base of most pecan pie recipes. Our pecan tart skips the corn syrup by featuring good old brown rice syrup, an ingredient easily found at Whole Foods, in its place. We added a little bourbon to keep things interesting. The result is a delicious pecan flavor that's not cloyingly sweet or gooey. This one is as keeper that'll definitely find its way onto our holiday dessert table. 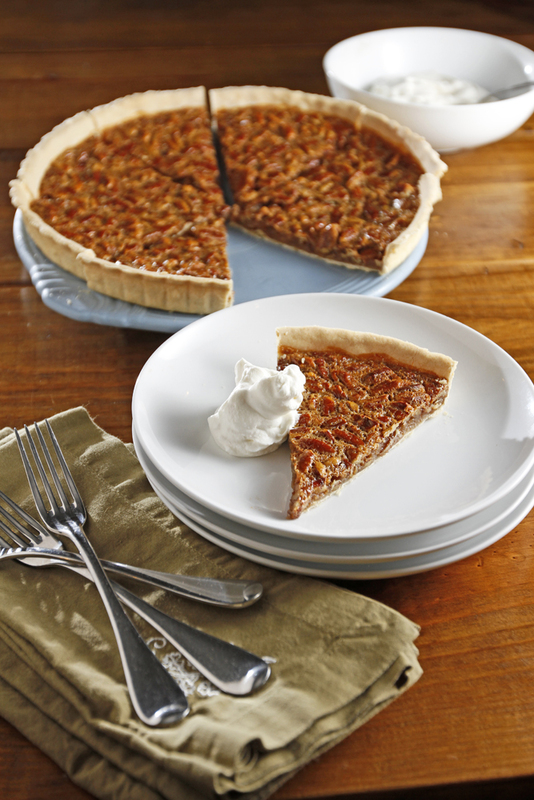 Make your own crust and whipped cream for this tart, and maybe you'll fall in love with pecan pie again, too. 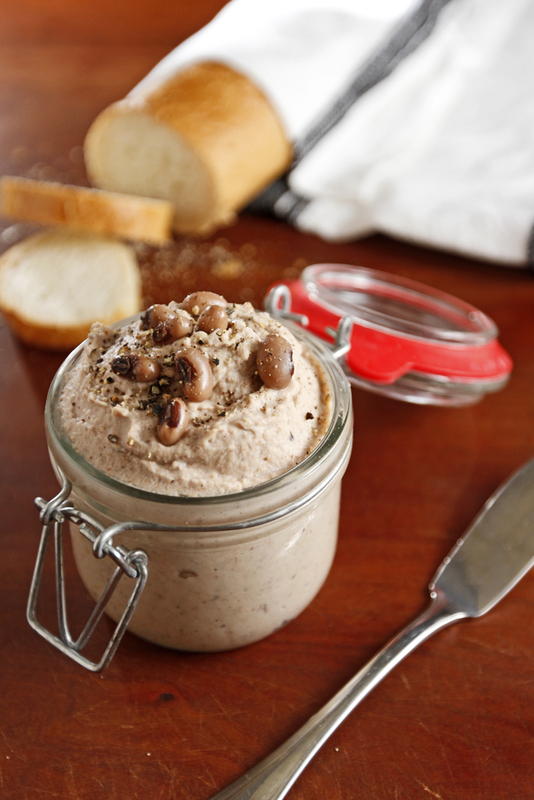 Don't save the black-eyed peas for New Year's Day. This is a super-easy treat you can enjoy all year long. This dish splits the difference between traditional hummus and typical Southern fare, but the outcome is something very special. The creaminess of the beans serves as the perfect vehicle for the heat of the Tabasco and the smokiness of the salt. This is a great dish for a party. You can make it ahead of time and have it on the table when your ravenous guests arrive. For a little extra flair, save a few peas to garnish the top of the dish. In a medium pan over medium-low heat, add the olive oil, garlic, coriander, and cumin. Cook for about 5 minutes or until the garlic has softened. Add the contents of the pan to the work bowl of your food processor along with the black-eyed peas, Tabasco, lemon juice, tahini, hickory smoked sea salt, and cracked black pepper. Blend until smooth. Serve with toasted baguette or pita chips. Makes 1 1/2 cups. Serves about 4 as an appetizer.